Several hospitals have completed upgrades; others are renovating or expanding both on and off their campuses. Earlier this year, Dignity Health-St. Rose Dominican, which operates three local acute-care hospitals, said it would build four neighborhood hospitals in the next two years. The moves aim to increase access to emergency care in underserved areas and expand Dignity’s local footprint. Construction will begin in the coming months on sites near Decatur Boulevard and Blue Diamond Road; West Flamingo Road and the Las Vegas Beltway; and Sahara Avenue and Decatur Boulevard, Brannman said. Once ground is broken, each facility will take about a year to complete, he said. Ground has already broken on the first facility, at 1550 W. Craig Road in North Las Vegas. That neighborhood hospital is expected to open in a year. The minihospitals will cost $28 million each and feature eight to 10 emergency department bays and eight to 10 inpatient rooms. They will also have labs and a pharmacy to support them, Brannman said. 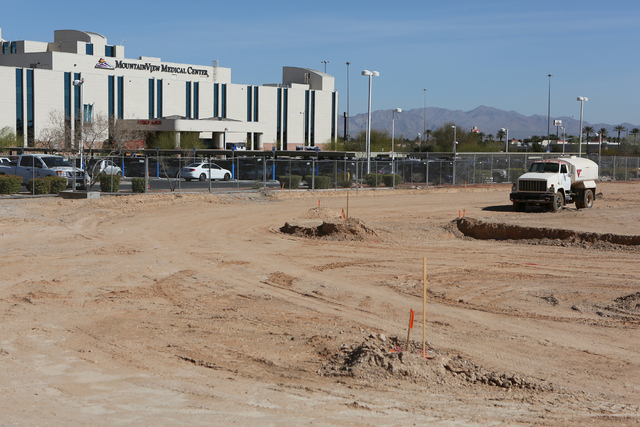 North Las Vegas will have three floors that include ambulatory surgery suites. The third floor will have primary care and specialty care physicians. There will also be space for community health services for hypertension, diabetes and prenatal care. The other three facilities will be two-story buildings with the upper floor used for primary care and specialty physicians. An emergency department will be an important aspect. The patients requiring the highest degree of care would be transferred to another facility, he said. St. Rose Dominican has entered a joint-venture agreement with Texas-based Emerus to build and manage these sites and to lay the groundwork for additional facilities through the region, Brannman said. This model has been successful in Colorado and Texas, creating shorter wait times in emergency departments while lessening the burden of existing emergency rooms, he said. Only 20 to 30 percent of patients who go through an emergency room are admitted to the hospital, he said. The North Las Vegas facility will offer surgery services and others will ultimately have those services, too, Brannman said. The same-day surgery would include endoscopic and colonoscopies, hernia repair and minor orthopedic and joint surgeries, he said. As Dignity launches its minihospital project, it’s completing its expansion and renovation of its Siena campus on St. Rose Parkway in Henderson. That campus, which opened in 2000, has increased by 200,000 square feet. It includes a new emergency department that is twice the size of the one it replaces. Added intensive care and intermediate care beds potentially double the capacity, Brannman said. “We also added operating rooms and expanded our neonatal intensive care unit and had some expansion in our laboratory, pharmacy and other support areas,” Brannman said. The hospital had 230 beds; it added 100 beds and the number of emergency room beds doubled from 28 to 56, he said. A second tower was added to the campus. The cost will run between $160 million and $180 million. The expansion started 18 months ago. Space began filling in November and facilities, including operating rooms, were renovated and remodeled. Work on those projects will finish by the end of April, bringing the hospital to full capacity, Brannman said. “We’re just growing the services we already had,” Brannman said. Dignity is also expanding its outpatient clinic with its medical group of primary care physicians and specialists going from 14 a year ago when it started to 41 today and 50 by the end of June, Brannman said. It will have as many as 70 physicians next year. Dignity is constructing a free-standing clinic on Gibson Road in Henderson that will feature an urgent care clinic with radiology and lab services. It will complement its existing five facilities, Brannman said. Other area hospitals also are expanding and updating their facilities. 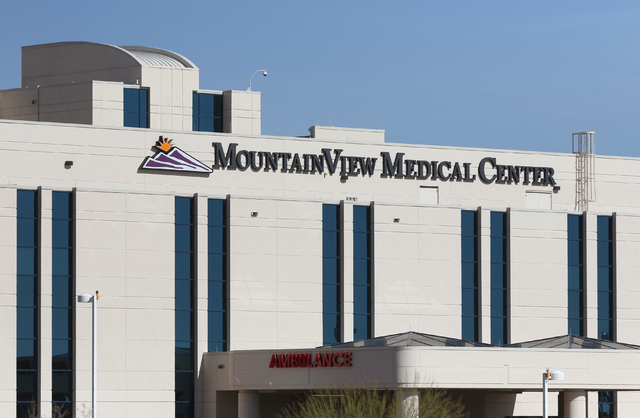 MountainView Hospital has started building a $90 million, multiphase expansion that adds 64 beds and expands and renovates the Women’s Services area, expands the emergency department services and adds a new medical office building and 24-bed neointensive care unit. The expansion is expected to finish by the third quarter of 2017, MountainView Chief Executive Officer Chris Mowan said. The first construction phase adds a fourth and fifth floor with 32 private rooms per floor. The Women’s Services unit’s expansion increases the delivery beds to 12 and increases postpartum beds to 32, Mowan said. As under the expansion, a dedicated CT scanner will be added to the emergency department and the helipad will be expanded to accommodate two helicopters. The first floor expansion also will add neurodiagnostic imaging and intervention technology to treat the most complex neuro/stroke conditions, Mowan said. MountainView is building an 80,000-square-foot four-story medical office building that includes a 225-seat auditorium to support continuing education and outreach, Mowan said. That building is on 8 acres adjacent to the hospital and will be completed by the first quarter of 2017. In 2013, the hospital added a south tower and doubled the size of its emergency department. 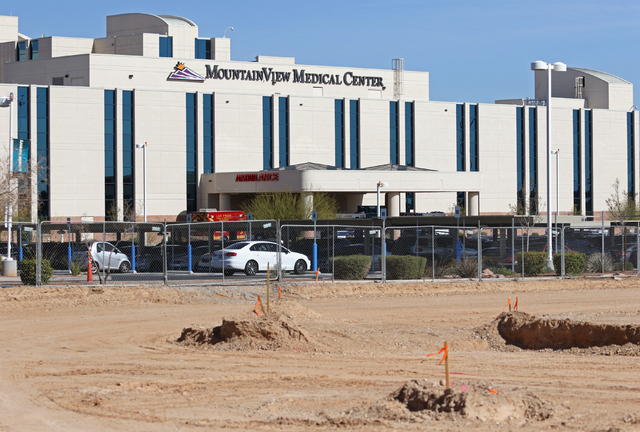 Southern Hills Hospital has broken ground for an emergency room at the southwest corner of Desert Inn and Fort Apache roads. The facility, to open in the third quarter, will measure 10,000 square feet and include 12 patient rooms. 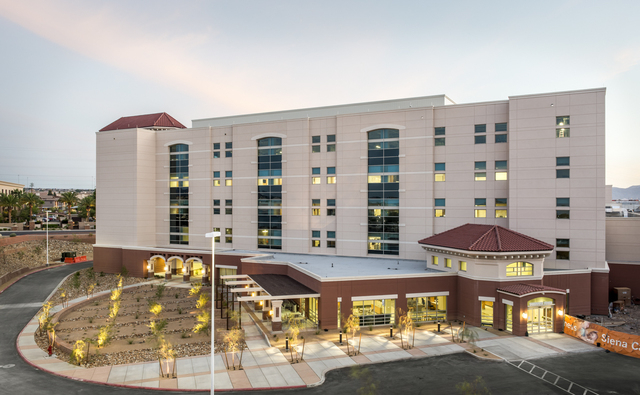 Spring Valley Hospital in southwest Las Vegas is building a four-story tower to expand its maternity services and medical and surgical inpatient capacity. It will have an open house in June. Centennial Hills Hospital is building out the fourth floor of its hospital to add 36 inpatient beds to bring its total to 226 when work finishes later this year. The nearly $10 million project includes transforming shelled space into 20 private medical and surgical rooms and 16 intermediate care rooms.